Mi-T-Polish works well on both silver and brass finish. It is a great, safe polish for all your polishing needs. Not only does it polish your instrument, but it smells great as well. Chemicals can smell harsh, and some smell like they have to be damaging your instrument. Not our products, safe to use on your instrument and you won't pass out while maintain that showroom shine. This product comes in a 8oz cylinder container with a fine mist spray. 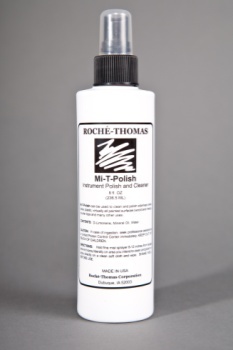 Oh did we mention it also comes with a Roche-Thomas Premium Polish Cloth. Why you ask, we know you like free, and why would you want to use our polish with a competitors 'rag'. Only the best = Roche-Thomas Mi-T (mighty) products! We know your goal is to shine when playing your instruments; well we want your instrument to shine like your music. Look good, play good! At Roche-Thomas we are proud that we can say our products are manufactured in the USA using products made in the USA, so you know you are purchasing the finest products on the market.